Nurses play the key roles in nursing homes. They plan patient care from medicines to therapy to diet. They provide the care (or make sure other staff members provide it) and evaluate the patient's progress and make changes as needed. Because nurses must care for several patients simultaneously and a patient's condition may change suddenly, the job can be stressful. Nurses are responsible for the care for all the patients assigned to them. 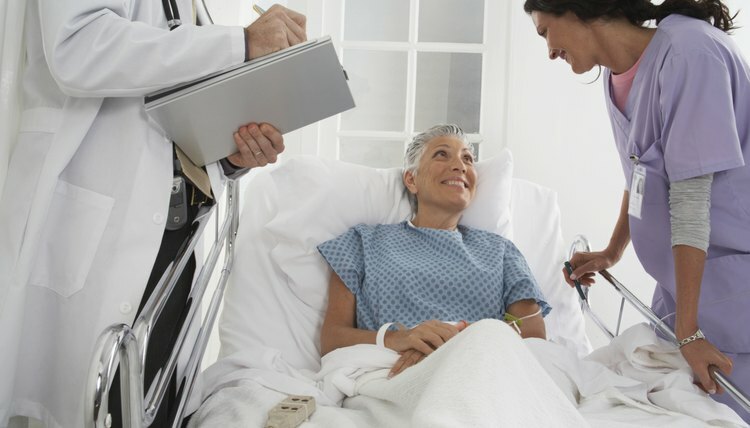 Generally, the nurse is assigned a group of patients each day. For that group, the nurse must monitor vital signs, pass medications, change dressings, check the status of wounds, attend patient care-plan meetings, oversee nurse aides, administer enemas and start intravenous (IV) medications and fluids. They may also counsel families, conduct range-of-motion exercises and provide other personal hygiene care, depending on nursing assistant staffing levels. 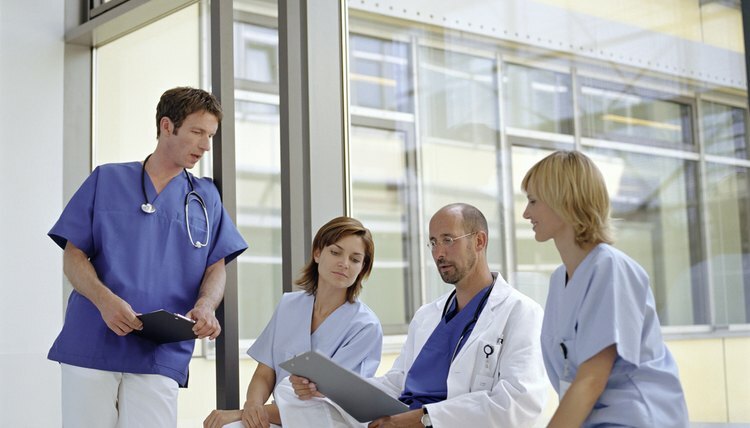 The number of patients varies according to the size of the facility and the type of shift. Generally, midnight shift nurses will be responsible for more patients as most of them sleep through the night and require little care. 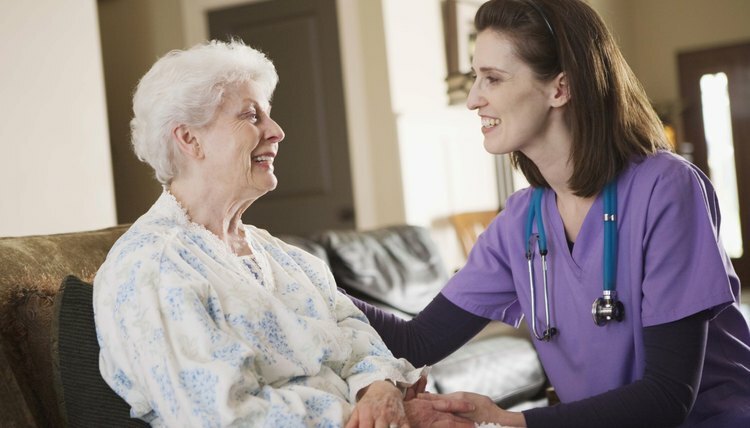 Nursing care at any nursing home follows a chain of command. At the bottom of that chain are nursing assistants (aka nurse aides), who work under the care of a staff nurse. In turn, the staff nurse oversees all the medical care for a certain group of patients. Both the nurse aide and the staff nurse report concerns and requests to the charge nurse, the nurse who oversees all nursing assignments. The nursing supervisor is responsible for all nursing personnel on a particular shift or unit. He reports to either the director of nurses (DON) or assistant director of nurses (ADON). The DON and ADON are responsible all nursing care throughout the facility. Licensed practical nurses (LPNs) generally work as staff nurses under the supervision of a registered nurse (RN). 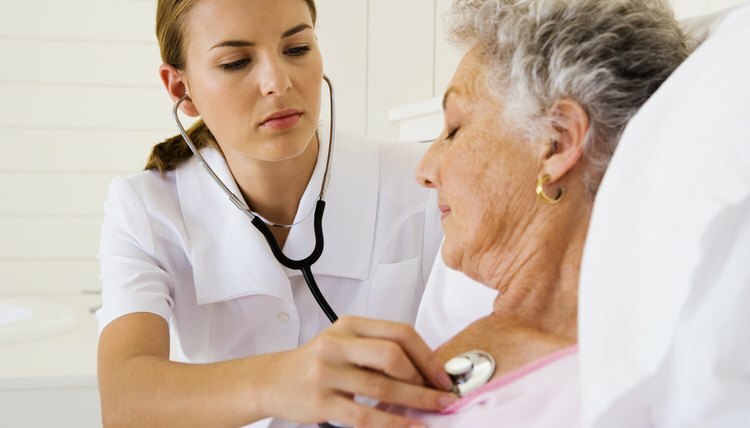 Licensed practical nurses can provide all the nursing skills of an RN and provide all the bedside care, but RNs are more involved in planning and evaluating the care given. LPNs receive about one year of training compared to two to four years for RNs. Because of litigation concerns, a great deal of a nurse's day-to-day duties involve keeping records. When a nursing home patient is admitted, nurses compile a great deal of information such as health history, insurance information, family contact information and current vital signs. Each time a medication or treatment is given, it must be properly recorded and the reports filed according to facility guidelines. The general rule of thumb in nursing practice is "if it was not properly reported, it didn't happen." If a complaint or lawsuit is filed, reports are the main evidence used to settle it. Nursing home nurses face many challenges: Patients may be unable to communicate or may be combative or angry. Family members may have strained relationships with the patient or with nursing home staff. The facility may be short-staffed (especially on weekends or major holidays), yet all patient care duties must be completed. Because nursing home residents depend on nurses for their care, it is essential that nurses have excellent health and are reliable. They must be kind, yet firm with the residents, their families and other staff members, even in stressful situations. Often it is the nurse who must organize the response to an emergency situation. For example, if a patient falls, has a heart attack or suddenly becomes combative, the nurse must direct others in handling the situation. Laura Brestovansky is a Michigan-based writer with more than 25 years experience. Her work has appeared on countless websites as well as in local newspapers such as the Oakland Press, the LA View and The Michigan Catholic. She has an honors degree in journalism from Eastern Michigan University. K., Laura. "The Role of a Nurse in a Nursing Home." , https://careertrend.com/about-5439263-role-nurse-nursing-home.html. 27 December 2018.